Posted by andrea tomkins in: Easy ways to make kids happy|Oh! Things! Mark’s parents gave Sarah a really pretty colour-by-number set for her birthday. We’ve purchased paint-by-number kits from Djeco before and enjoyed them very much. The new one comes with felt-tip markers instead of paint. Two things stand out about this particular set. (1) This colour-by-numbers doesn’t actually have any numbers printed on the artwork. I love this. No bleed-through! (2) The finished results are charming and beautiful, and could be hung just about anywhere. Think of how proud your child would be to see his/her work hanging in the front hall! 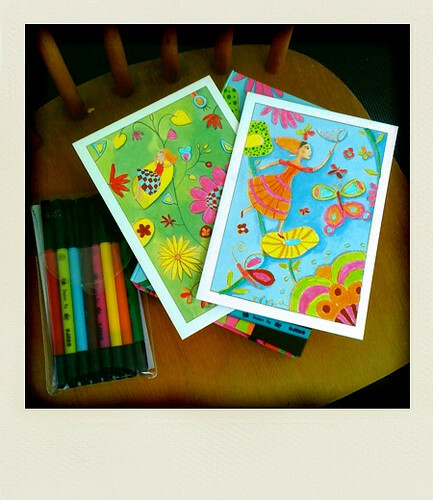 The set comes with several pieces of art (printed on a sturdy canvas-like material, not paper), brightly coloured dual-sided markers (each one has a thin side and a thick side), and a booklet. The booklet suggests which colours to use. Sarah has been working so hard on her art. It does my heart good to see her efforts pay off and result in something so pretty. Share the post "Perfect gift for little artists"
11 Responses to "Perfect gift for little artists"
And just checked out the website – it’s fun and cute! These are so awesome! Thanks for the link! Super lovely. Where did you buy them? After doing an internet search I found much stock from Djeco at Three Monkeys in the Glebe (just south of Bank and Sunnyside) … there were so many to choose from ! It was really hard to decide which ones to buy. And then I had to resist buying more of the wonderful Waldorf dolls, toys and art supplies! Hello birthday presents for the daughters and nieces! my niece turns 8 next weekend and I think you just suggested the perfect gift! Thanks. I love this company! Santa has been bringing my kids these kits for a few years and they are special. If you like at Tag Along Toys pick it up – they fly off the shelves. Don’t think that these are just for children – I bought myself one of the felt-tip colouring kits as a little Christmas present to myself – LOVE IT!! It is rather meditative (which is good for me these days!! ).